Cream with firming effects, easily absorbed: quick, lasting and spectacular effects. Makes the skin smooth and supple while giving it all its radiance. Stimulates the growth of the extra-cellular matrix. 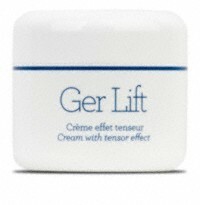 Marine Ger-Lift can be used to restore superficial skin elasticity and reduce wrinkles. Marine Ger-Lift assists fibroblasts to produce collagen and it increases cellular respiration. It restores dermal elasticity, therefore diminishing wrinkle depth. Six biological compounds extracted from micro-algae, marine peptides and trace elements. Use a small amount on the areas of concern or on the whole face including the eye and neck areas. Follow with your Synchro nutritive cream.